This investigation was designed to analyze the time-trial (STT) in an international cross-country skiing sprint skating competition for (1) overall STT performance and relative contributions of time spent in different sections of terrain, (2) work rate and kinematics on uphill terrain, and (3) relationships to physiological and kinematic parameters while treadmill roller ski skating. Total time and times in nine different sections of terrain by 12 world-class male sprint skiers were determined, along with work rate and kinematics for one specific uphill section. In addition, peak oxygen uptake (VO2peak), gross efficiency (GE), peak speed (Vpeak), and kinematics in skating were measured. Times on the last two uphill and two final flat sections were correlated to overall STT performance (r = ~−0.80, P < 0.001). For the selected uphill section, speed was correlated to cycle length (r = −0.75, P < 0.01) and the estimated work rate was approximately 160% of peak aerobic power. VO2peak, GE, Vpeak, and peak cycle length were all correlated to STT performance (r = ~−0.85, P < 0.001). More specifically, VO2peak and GE were correlated to the last two uphill and two final flat section times, whereas Vpeak and peak cycle length were correlated to times in all uphill, flat, and curved sections except for the initial section (r = ~−0.80, P < 0.01). Performances on uphill and flat terrain in the latter part were the most significant determinants of overall STT performance. Peak oxygen uptake, efficiency, peak speed, and peak cycle length were strongly correlated to overall STT performance, as well as to performance in different sections of the race. The endurance sport of cross-country skiing on varying terrain and at widely varying speeds is both physically and technically demanding (Andersson et al. 2010; Saltin 1997; Smith 1992). During competitions the skier must constantly alter the rate of work and technique to suit the terrain (Bergh and Forsberg 1992; Norman and Komi 1987; Smith 1992). Sprint cross-country skiing begins with a time-trial qualification, followed by three knock-out heats. Although analyses of simulated sprint skiing have recently been performed both during roller skiing (Mikkola et al. 2010; Stoggl et al. 2007; Vesterinen et al. 2009) and on snow (Andersson et al. 2010; Zory et al. 2006, 2009), an actual sprint competition has not yet been examined. In distance races, approximately 50% of total skiing time involves moving uphill and this is generally regarded as the major determinant of performance (Bergh and Forsberg 2000). This finding also appears to apply qualitatively to sprint events employing the skating technique (Andersson et al. 2010). Such uphill work rates have been estimated to be 10–30% above what can be produced aerobically and approximately 50% higher than corresponding work rates on level terrain (Norman and Komi 1987; Norman et al. 1989). Thus, the total work rate in sprint skiing on uphill terrain may be hypothesized to be as high as 150% of peak aerobic power. Today’s world-class sprint skiers achieve higher peak oxygen uptake, greater efficiency, longer cycle length, and higher maximal speed compared to national level sprint skiers (Sandbakk et al. 2010a, b). Vesterinen et al. (2009) found that anaerobic capacity was closely related to performance in the first heats of a simulated sprint race, whereas aerobic capacity became more important during consecutive heats. Furthermore, Andersson et al. (2010) found that the velocity decrease in the uphills from the first to the second half of a sprint time-trial was correlated with VO2max. In the case of cycling, the best uphill riders demonstrate higher maximal oxygen uptake, whereas the best riders on flat terrain have higher maximal power and speed (Sallet et al. 2006). The specific influence of physiological characteristics on different terrains within the sprint heats should be examined more extensively. The present study was designed to investigate (1) the contribution of uphill, flat, and downhill sections to overall sprint time-trial (STT) performance, (2) work rate and kinematics on uphill terrain, and (3) the relationships of these parameters to physiological and kinematic characteristics utilizing roller ski skating in the laboratory. Three hypotheses were tested: (1) average speed on uphill terrain is the major determinant of STT performance; (2) skiers perform at work rates >150% of peak aerobic power on uphill terrain; and (3) peak oxygen uptake and efficiency on uphills, and maximal speed on flat sections are of particular importance to overall STT performance. Twelve elite male sprint cross-country skiers, including three World Champions, volunteered to participate in this study. Their background characteristics and sprint performance levels (classified according to the system proposed by the International Ski Federation (FIS) (2009), are shown in Table 1. This study was pre-approved by the Norwegian Regional Ethics Committee, Norway and all subjects were fully informed of its nature before providing their written consent to participate. Initially, a time-trial for an international FIS sprint skating competition in cross-country skiing was investigated with respect to overall performance and time spent in nine different sections of terrain, as well as kinematics and estimated work rates for one representative uphill section of terrain. The kinematics were examined by analyzing video and work rates estimated from the combined contribution of work against gravity, gliding friction, and air resistance. One week later, the subjects performed treadmill roller ski skating in the laboratory and were assessed for (1) gross efficiency (GE) in a submaximal test; (2) peak oxygen uptake (VO2peak), treadmill performance and kinematics in a ~5-min incremental test; and (3) peak treadmill speed (Vpeak) in a ~1-min incremental test. The STT was performed on a 1,820 m track, with equal portions of uphill, flat, and downhill terrain and a total climb of 35 m and maximal difference in elevation of 24 m. Each lap consisted of nine different sections of terrain (S1–S9), with different properties (Fig. 1; Table 2). The three uphill sections (S3, S4, and S7), had mean inclines of 5.5, 6, and 8%; the two downhill sections (S2 and S6) mean inclines of 5 and 6%; and the three flat sections (S1, S8, and S9) mean inclines lesser than ±1%. There was also one curved section (S5) with an initial 3% incline and a 180° turn. All of the subjects warmed-up according to individual programs optimized for sprint races and used their own racing poles (90 ± 1% of body height in length) and skis (105 ± 2% of body height). The weather was stable with no wind, air, and snow temperatures of −4°C, and relative air humidity of 75%. In order to minimize the influence of different gliding properties, all of the skis had a similar stone-grind and were waxed by a professional ski technician with the same fluorine wax. The friction coefficient on snow (μ s) was calculated on the basis of measurements of deceleration performed three times 30 min prior to the start of the STT. For this, one of the subjects (weighing 80 kg) glided passively down a 5% downhill incline onto a 20-m flat zone, sitting in a tucked-down position and with an initial speed of 3 m s−1. Two pairs of photocells (Speedtrap II Timing System, Brower Timing Systems, Draper, UT), placed 20 cm above the ground and with 50 cm between the members of each pair, were employed to determine the initial and final speeds. The loss of speed was used to calculate the force-balance (deceleration) and subsequently, the friction coefficient (μ s = a · g−1 = ~0.04), ignoring the force of air drag which was minimal at this slow speed. The friction coefficient obtained was similar to that reported earlier for similar conditions (Buhl et al. 2001). The mean drag force on one subject (an elite skier) whose height and mass were approximately the same as the mean for the entire group was measured in a wind tunnel. This subject simulated the skating technique used in uphill terrain on a sliding board mounted on two Kistler force plates (Kistler 9286AA, Kistler Instrument Corp., Winterthur, Switzerland), as described by Leirdal et al. (2006). The wind was propelled by a 220 kW centrifugal fan and the test area was 12.5 m long, with a width of 2.7 m and a height of 1.8 m.
The time spent in each section of the STT and the total time were measured with 10 synchronized 50-Hz video cameras (DCR-TRV900E, Sony Inc., Tokyo, Japan), placed 20 m away from and perpendicular to the track. The times captured when skier’s hip passed the reference poles between the different sections were analyzed in DartFish Pro 4.5 (DartFish Ltd., Fribourg, Switzerland). Our measurements of total times differed by 0.12 ± 0.03 s from the official total times. A panning 50-Hz Sony video camera (Sony Handycam DCR-VX2000E, Sony Inc., Tokyo, Japan) monitored the skiers for 6 consecutive cycles during the mid-part of one uphill section (S4) to allow determination of cycle length and cycle rate. Final competition rankings (after knock-out heats) were also assessed. All treadmill tests were performed using the G3 technique with an incline of 5% on a 6 × 3 m motor-driven treadmill (Bonte Technology, Zwolle, The Netherlands). This skating technique was the one employed the most in the STT and the chosen incline corresponded to the analyzed uphill section of terrain. This allowed us to compare work rates and kinematics between skiing on snow and while treadmill roller skiing. The inclination and speed were calibrated by using the Qualisys Pro Reflex system and Qualisys Track Manager software (Qualisys AB, Gothenburg, Sweden). The non-slip rubber surface of the treadmill belt allowed the subjects to use their own poles equipped with special carbide tips. A safety harness secured the subjects during the testing. In order to minimize variations in rolling resistance, all subjects used the same pair of Swenor roller skating skis with standard wheels (Swenor Roller skis, Troesken, Norway). The rolling friction force (F f) of these skis was assessed prior to testing using a towing procedure described previously (Sandbakk et al. 2010a). The rolling friction coefficient (μ r) was determined by dividing F f by the normal force (N) (μ r = F f × N −1), and the μ r value (0.024) obtained was incorporated into the calculations of work rate. Two synchronized 50-Hz Sony video cameras fixed to the front and side of the treadmill (Sony Handycam DCR-VX2000E, Sony Inc., Tokyo, Japan) recorded kinematics for analysis by DartFish Pro 4.5. Respiratory variables were measured employing open-circuit indirect calorimetry with an Oxycon Pro apparatus (Jaeger GmbH, Hoechberg, Germany). Prior to each measurement, the VO2 and VCO2 analyzers were calibrated using a highly precise mixture of gases (16.00 ± 0.04% O2 and 5.00 ± 0.1% CO2, Riessner-Gase GmbH & co, Lichtenfels, Germany) and the expiratory flow meter was calibrated with a 3-l syringe (Hans Rudolph Inc., Kansas City, MO). Heart rate (HR) was assessed with a heart rate monitor (Polar RS800, Polar Electro OY, Kempele, Finland) and the blood lactate concentration (BLa) of 5 μl-samples were taken from the fingertip with the by Lactate Pro LT-1710t kit (ArkRay Inc, Kyoto, Japan), as validated by Medbo et al. (2000). GE was determined in a sub-maximal 5-min test at a skiing speed of 3.9 m s−1. VO2, VCO2, and HR were monitored continuously and the average value for the last minute is presented. BLa was measured immediately after completion of the test. Thereafter, VO2peak and treadmill performance (time to voluntary exhaustion; TTE) were assessed with an incremental treadmill test. The initial speed of 4.4 m s−1 was increased by 0.6 m s−1 after 1 and 2 min and thereafter by 0.3 m s−1 every minute until exhaustion. Gas exchange and HR were measured continuously. The average of the three highest consecutive 10-s measurements of VO2 was designated as VO2peak and used in the calculation of peak aerobic metabolic rate and peak aerobic power. BLa was measured 1, 3, and 5 min after completion of the test and the highest of these values designated as peak BLa. The test was considered to have been performed at a maximal level of effort if the following three criteria were met: (1) a plateau in VO2 despite increased exercise intensity, (2) RER > 1.10, and (3) peak BLa > 8 mmol l−1. The VO2 plateau was defined as the time VO2 was within 150 ml of the identified VO2peak (Brink-Elfegoun et al. 2007). TTE was the time at which the subject was no longer able to maintain the front wheels of the roller skis’ in front of a marker 4 m from the forward edge of the treadmill. Kinematics were analyzed during the final 30-s work load completed. Assessment of peak treadmill speed (Vpeak) involved an initial 30-s period at medium intensity (4.4 m s−1), followed by an increase to the starting speed of 5.0 m s−1, and subsequent incremental increases of 0.3 m s−1 every 10 s until exhaustion was reached. The criterion for exhaustion was the same as that used in the VO2peak test. Vpeak was calculated as v = V f + [(t · T −1) V d], where V f was the speed of the final work load completed, t the duration of the last work load, T the duration of each work load, and V d the difference in speed between the last two workloads (Holmberg et al. 2005). The different skiing techniques were designated as G2, G3, G4, G5, G6, and G7, according to Andersson et al. (2010). G2, a technique for skiing uphill, involves an asymmetrical double pole push in connection with every other leg push. G3, used on moderate inclines and level terrain, involves one double pole push together with every leg push. G4, a symmetrical double pole push in connection with every other leg push is used on level terrain. G5 is downhill skating in a low position with only using the legs. G6, a technique for curves in which leg work is performed with or without poling and G7 downhill skiing in a low stance position without leg or pole push. In the current study, the G3 technique was used for all kinematic analyses, both on snow and on the treadmill. One cycle contained two pole plants and the cycle time was determined as the average time between two pole plants during 6 cycles. Cycle length was calculated as the speed multiplied by the cycle time and the cycle rate was the reciprocal of cycle time. Skiing speed on the selected uphill section was based on the average speed for that section while speed during the VO2peak test was identified as the treadmill speed during the final 30-s work load completed. Pole and leg push-off times were also analyzed at the final 30-s work load of the VO2peak test. The pole push-off time began when the pole was planted and ended when it lost contact with the ground. The push-off time for the leg began when the pole was planted and ended when the roller ski lost contact with the ground. The recovery times for the legs and poles were calculated as cycle time minus push-off time. Ptot was estimated for the uphill section that best differentiated performance during a pilot test. This section was straight and GPS data (Polar 800CX, Polar Electro OY, Kempele, Finland) during pilot testing indicated that speed remained relatively constant (<5% range). Ptot was calculated as the sum of power against gravity (Pg), friction (Pf), and air drag (Pd), with v being the average section speed, α the angle of incline, μs the coefficient of friction, p the density of the air, A the exposed frontal area of the skier, and Cd the drag coefficient (Eq. II). As the skis angle outwards while skating, their resultant speed is greater than the average speed in the direction of travel. Therefore, v ski (=v/cos(orientation angle)) was incorporated into the calculations of P f. The ski orientation angles were estimated from 3D analysis of 6 subjects (a representative sample) skating at different speeds on the treadmill at a similar inclination and the resulting mean linear relationship of v ski to speed was used calculating the work rate. Moreover, skiers apply their body mass to the poles while poling, thereby reducing the mean normal force on the skis during a cycle and influencing P f. Therefore, the work rate calculations were adjusted for body mass according to Millet et al. (1998a, b), revealing that the average poling force (as a percentage of body mass) was stable at approximately 7% for the speeds attained with the G3 technique on a 5% incline. The wind drag component A · C d was estimated as 0.35 from wind tunnel testing. GE, determined during the sub-maximal test on the treadmill at an incline similar to that of section S4, was calculated as the work rate divided by the total metabolic rate under steady-state conditions, according to Sandbakk et al. (2010a). The work rate was calculated as the sum of P g and P f, with incorporation of v ski and adjusted body mass (see above). The aerobic metabolic rate was determined from the mean VO2 and VCO2 during the last minute of the test using the RER value and standard conversion tables (Peronnet and Massicotte 1991). The anaerobic metabolic rate was calculated from the BLa measured immediately after the finish of the test as earlier described by di Prampero and Ferretti (1999). In these calculations, 1 mmol l−1 of BLa was considered equivalent to 3 ml kg−1 of oxygen consumed with an RER value of 1.0 and converted to anaerobic metabolic rate employing the standard conversion tables. All data were shown to be normally distributed with a Shapiro–Wilks test and are presented as means and standard deviations (SD). Correlations between the various parameters were analyzed using Pearson’s product–moment correlation coefficient test and simple linear regression was used to draw trend lines. A t test for dependent correlations, according to Chen and Popovich (2002) was applied to test for differences between section times in relationship to STT performance. The relationship between STT performance and final competition ranking (after knock-out heats) was analyzed using Spearman rank rho correlations. The coefficient of variation (SD · mean−1) · 100% within each section was also calculated. Stepwise multiple regression was employed to predict STT performance from the physiological and kinematic parameters. Potential interactions and confounders were examined according to Kleinbaum et al. (1998). These regression analyses are presented as non-standardized and standardized coefficients. 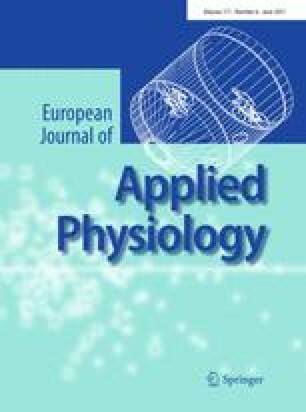 Repeated measurements of the physiological and kinematic parameters on the treadmill demonstrated intraclass correlation coefficients of >0.90. The corresponding coefficients for repeated determinations of STT performance and the relative contribution of section times during pilot testing were 0.90–0.95. Statistical significance was set at α value of <0.05. Bonferroni alpha levels, adjusted for the number of variables tested against each other, were used to examine correlations between the entire terrain, specific sections thereof and laboratory parameters versus STT performance. All statistical analyses were processed using the SPSS 11.0 Software for Windows (SPSS Inc., Chicago, IL). The skiers’ mean STT time was 240 ± 5 s (234–248) and their final mean placement in the STT 11 ± 13 (1–46). The periods on the uphill, flat, downhill, and curved terrains were approximately 36, 27, 30, and 7% of the total racing time, respectively (Table 2). Six different techniques were used in the different sections of the track (Table 2), with G3 being predominant. STT performance was strongly correlated to sprint FIS points (r = 0.96, P < 0.001), as were the times spent on uphill and flat terrain to STT performance (Fig. 2, P < 0.01 in all cases), with no significant difference between the latter two correlations. In contrast, the time spent on downhill terrain was not significantly correlated with STT performance and the correlation coefficient in this case was significantly lower than the corresponding coefficients for the relationship between STT performance and time on uphill and flat terrain (P < 0.05 in both cases). With respect to the time spent in specific sections of terrain, the last two uphill sections (S4 and S7) and the two final flat sections (S8 and S9) exhibited significant relationships to STT performance (Table 2, P < 0.01 in all cases), which was not the case for the first three sections (S1–3), the curved section (S5), or the final downhill section (S6). The correlation coefficients between STT performance and S4 and S7–9 were significantly different than the correlations with S1–2 (P < 0.05 in all cases). The coefficients of variation within each section showed patterns similar to the correlations themselves, with the highest variation in time spent being associated with the last two uphill sections (S4 and S7), followed by the two final flat sections (S8 and S9; Table 2). STT performance significantly correlated with final competition ranking (after knock-out heats) (r = 0.85, P < 0.01), with correlations reaching statistical significances in the case of the last two uphill and two final flat sections (r = −0.75 to −0.80, P < 0.05 in all cases). The cycle rate and length in the uphill section examined (S4) were 0.70 ± 0.04 Hz and 7.6 ± 0.7 m, respectively. Cycle length was negative correlated with both the time spent in this section and STT performance (r = −0.75 and −0.72, P < 0.01 in both cases), whereas cycle rate demonstrated no correlation to these two parameters. The estimated mean work rate in S4 (eq. II) was 476 ± 42 W, which is approximately 60% greater than the peak aerobic power (i.e., 298 ± 37 W, as assessed by the VO2peak test). Work against gravity, friction, and air resistance for this section was estimated to be approximately 54, 36, and 10%, respectively, of the total work. Treadmill performance (i.e., TTE in the VO2peak test) was strongly negatively correlated to overall STT performance (r = −0.88, P < 0.001), as well as to the time spent on the uphill and flat sections of the STT (r = −0.85 and −0.80, P < 0.001 in both cases). Regarding the individual sections, strong positive relationships between TTE and time spent were observed for the last two uphill (S4 and S7) and two final flat sections (S8 and S9) (r = ~−0.80, P < 0.01 in all cases), whereas times spent on the first three sections (S1–3), the curved section (S5), and the last downhill section (S6) were not significantly correlated with TTE. The correlations between physiological parameters versus STT performance and time spent in the different sections of the terrain are documented in Table 3 and Fig. 3. VO2peak, GE, and Vpeak (measured in connection with treadmill roller skiing) showed strong negative correlations to overall STT performance and even stronger negative correlations to the time spent in uphill and flat terrain (Table 3, P < 0.05 in all cases), but only moderate negative correlations to S4 (r = ~−0.75, P < 0.05 in both cases). Vpeak was negatively correlated to the time spent on all uphill and flat sections, except for S1 (r = −0.75 to −0.80, P < 0.05 in all cases), as well as the time spent on the curved section (S5; r = 0.78, P < 0.05). The peak BLa obtained after the VO2peak test and anthropometric parameters exhibited no significant correlation with the time spent in any section of terrain. The peak cycle length in connection with treadmill roller skiing was strongly negatively correlated to overall STT performance, as well as the time spent on uphill and flat sections (with the exception of S1), and moderately negatively correlated to the time spent in the curved section (Table 3, P < 0.05 in all cases). Both peak cycle length and rate on the treadmill demonstrated strong positive correlations to the corresponding parameters for the selected uphill section of the STT on snow (r = ~0.90, P < 0.001 in both cases). Moreover, in the laboratory peak cycle length correlated strongly with pole and leg recovery times (r = ~0.80, P < 0.01 in both cases). The main findings of the present study were as follows: (1) average speeds in the last two uphill and two final flat sections of the race were strongly correlated to overall sprint time-trial performance; (2) cycle length in one uphill section of the STT (S4) was associated with average speed on this section, as well as overall STT performance; (3) estimation of the work rate in S4 revealed that the skiers performed at approximately 160% of their peak aerobic power in this section; (4) performance and kinematics in connection with treadmill roller skiing exhibited a strong positive correlation to these same parameters during the STT on snow; (5) peak oxygen uptake and gross efficiency showed strong positive relationships to overall STT performance, and average speeds in the last two uphill (S4 and S7) and two final flat sections (S8 and S9) of the race, whereas peak treadmill speed and peak cycle length were correlated to overall STT performance, and average speeds in uphill, flat and curved sections throughout the entire STT. Our observation that the times spent on the uphill, flat, downhill, and curved sections of terrain accounted for approximately 36, 27, 30, and 7%, respectively, of the total racing time differs from the findings by Berg and Forsberg (2000) that more than half of the total time in a distance cross-country skiing race was spent on uphill terrain. The time spent uphill is also slightly lower than that in an earlier study into sprint skiing (Andersson et al. 2010). In the present study, average speed in the last two uphill sections (S4 and S7), followed by the two final flat sections (S8–9) were the most significant determinants of overall STT performance, as well as for overall sprint ranking after the man against man knock-out heats. The importance of uphill skiing for overall race performance has been observed previously in connection with both distance and sprint skiing (Andersson et al. 2010; Bergh and Forsberg 2000), but the contribution of flat skiing is a novel finding that may be explained by the flatter nature of sprint skiing tracks and the more pronounced significance of skating in flat terrain. The flatter terrain in the end of the race in the current study, compared to the study of Andersson et al. (2010), may explain these studies’ different results. It is noteworthy that the time spent on the initial 180-m flat section of the STT was not significantly correlated to performance, showing a lower correlation to overall STT performance than the two flat sections at the end of the race (S8 and S9). This observation indicates that the time required to achieve maximal speed from a standing position may not differ significantly between elite sprint skiers, a conclusion supported by a previous finding of similar performances by world-class and national level sprint skiers in connection with a 30-m acceleration test (Sandbakk et al. 2010b). The current study, as well as the study of Andersson et al. (2010), shows that the speed in downhill sections was not significantly correlated to overall STT performance. It should be noted that the downhill sections involved were relatively straightforward and not technically difficult, so that the skiers were gliding mostly in the deep stance typically used downhill (i.e., the G7 technique) and these sections may thus have been used primarily for recovery. At the same time, since better sprint skiers recover more rapidly (Sandbakk et al. 2010b), the downhill sections may have exerted an indirect impact on performance on the subsequent flat and uphill sections of the race. In order to examine in greater detail the relationship between performance on uphill terrain and overall STT performance, the uphill section S4 was analyzed more closely. Longer cycle lengths were associated with higher average speeds in this section, in agreement with a previous study on skiers using the skating technique during a distance cross-country race (Bilodeau et al. 1996). Thus, cycle length appears to be strongly connected to uphill skiing speed. A previous sprint time-trial study found slightly reduced cycle lengths with maintained cycle rates in the G3 technique from the first to the second lap (Andersson et al. 2010). Furthermore, the mean work rate in S4 was approximately 160% of the skiers’ peak aerobic power. Two earlier studies demonstrated that, among world-class cross-country skiers 25 years ago, the uphill sections of 15 and 30 km races in the classical technique were also performed well above peak aerobic power (Norman and Komi 1987; Norman et al. 1989). In other types of endurance sport involving racing times comparable with the STT investigated here (i.e., approximately 4 min), about 20–30% of the total energy requirement during competitions is supplied by anaerobic energy processes (Gastin 2001). Despite the intense work rate in the uphill section analyzed, the relative anaerobic and aerobic energy contributions during the entire STT might be similar to those in other endurance sports, as a consequence of the lower work rates on flat and downhill terrain. This proposal is supported by the report by Norman and Komi (1987) that work rates on level terrain are approximately 50% lower than on steep uphill terrain. A rough estimation of the work rates on flat terrain in the current investigation, based on the same formula and assumptions as for the uphill terrain (see the “Methods” section), indicates rates of work slightly greater than peak aerobic power, i.e., considerably lower than on uphill terrain. Because of the passive nature of the downhill sections of the STT, the metabolic costs on this terrain were probably well below peak aerobic power. Thus, the varying terrain associated with cross-country skiing allows skiers to recover while going downhill, thereby enabling them to generate more pronounced anaerobic power when skiing uphill. Variations in power output on different terrains and under different conditions in connection with cycling has previously been shown to optimize performance (Swain 1997) and this aspect of cross-country skiing clearly merits further examination. This investigation constitutes the first comparison between performance and kinematics of skiing on a treadmill and on snow. TTE on the treadmill was associated with STT performance on snow, with the most pronounced relationships to the average speed in the uphill and flat sections. These findings indicate that treadmill testing is of relevance in evaluating performance in connection with sprint skating on snow. Furthermore, the current study provides novel information regarding the physiological and kinematic laboratory parameters that are strongly correlated to STT performance. Multiple regression analysis revealed that VO2peak, Vpeak, and peak cycle length in combination provided the best prediction of STT performance with the second best regression model involving VO2peak, Vpeak, and GE. The standardized coefficients in these models were not significantly different and these four independent variables all exhibited relatively similar correlations to STT. The significance of VO2peak for sprint skiing performance observed here has also been reported previously (Sandbakk et al. 2010a, b) and receives further support from several studies on other middle-distance sports, such as running, rowing, and kayaking (Brandon 1995; Michael et al. 2008; Secher 1993). Vesterinen et al. (2009) suggested that high aerobic capacity reduces fatigue and improves total performance during four heats of sprint skiing, whereas high anaerobic capacity is associated with better performance in the first two heats. The current investigation reveals a considerable importance of VO2peak to performance in the qualification heat (i.e., a STT) as well. The strong correlations to performance on uphill and flat terrain during the last part of the race reveal that aerobic capacity influences the ability to maintain speed even during a single sprint time-trial. The strong negative correlation between Vpeak and STT performance reported here illustrates the general importance of high-speed ability for sprint time-trial performance, as also demonstrated in previous studies (Andersson et al. 2010; Sandbakk et al. 2010a, b; Stoggl et al. 2006, 2007; Vesterinen et al. 2009). Vpeak was negatively correlated to performance on all uphill, flat, and curved sections of the STT, with the exception of the initial flat section. This lack of a significant correlation between Vpeak and the first section time may indicate that the faster skiers employed a pacing strategy, using a lower percentage of their speed capacity in beginning of the STT to promote their ability to maintain higher speed during the rest of the race. The relationship between Vpeak and the ability to maintain speed on uphill, flat, and curve sections of the STT may also reflect a higher anaerobic capacity in better skiers, as also previously suggested (Sandbakk et al. 2010b; Stoggl et al. 2007). The negative correlation between GE and STT performance observed here is in agreement with earlier reports that GE is both correlated to treadmill performance and FIS points, and distinguishes world-class from national level skiers (Sandbakk et al. 2010a, b). The technical complexity involved in cross-country skiing, raises the possibility that the efficiency with which muscle power is converted into external power and speed may differ between skiers and, thus, that performance will be influenced by the ratio of work rate to metabolic rate. One limitation of the present investigation is that GE was measured during treadmill roller skiing and not on snow. Accordingly, GE must be further examined on snow, as well as in connection with different skiing techniques. The peak cycle length on the treadmill exhibited pronounced negative correlations to STT performance as well as to the average speed on flat and uphill terrain, in agreement with other observations that better skiers have longer cycle lengths when skating (Bilodeau et al. 1996; Rundell and McCarthy 1996; Stoggl and Muller 2009). Furthermore, leg and pole recovery times were strongly correlated to peak cycle length here. One explanation for this may be that longer cycle lengths and pole and leg recovery times demonstrated by better skiers are consequences of greater push-off power, as recently shown by Stöggl et al. (2010). Other studies have also related cycle length to strength and power (Bilodeau et al. 1996; Stoggl et al. 2007), as well as to technical aspects of skiing (Bilodeau et al. 1996; Sandbakk et al. 2010a; Stoggl and Muller 2009). However, cycle length may also be a function of work rate and speed with longer cycle length as an outcome in faster skiers. The current findings reveal that the times spent on uphill and flat terrain, especially during the latter part of the race, correlate to STT performance, indicating that the ability to maintain speed is crucial. On a treadmill better sprint skiers demonstrate higher peak oxygen uptake, more efficient technique, and greater speed, as well as longer cycle lengths. VO2peak and GE are important determinants of performance on uphill and flat terrain during the latter part of the race, whereas Vpeak and peak cycle length are of great significance for performance on flat, uphill, and curved terrain throughout the race, with the exception of the initial section (S1). Superior time-trial performance in sprint skiing is therefore characterized by a greater ability to generate and maintain speed. The current results show that the most significant determinants of STT performance can also be applied to the total competition ranking after the man against man knock-out heats. However, the importance of the final section of a race might be particularly important during the knock-out heats. This study was supported financially by the Mid-Norway branch of the Norwegian Olympic Committee. The authors would like to thank the subjects and their coaches for their cooperation and participation, the staff at the Norwegian School of Sport Sciences for collecting the field data; to Espen Emanuelsen for assistance in analyzing the data, and to John F. Moxnes for valuable comments on the manuscript.